To those unfamiliar with my “On Paper” series, I have provided links to all the previews below. Founded in 1993, the Florida Marlins took little time to make an impact as they won the 1997 World Series crown in seven games over the Cleveland Indians. Due to financial issues that team was blown-up, restocked with young talent and once again struck gold by winning another World Series in 2003. Just look at some of the young stars on that team; Derrek Lee, Miguel Cabrera, Josh Beckett, Juan Pierre and Brad Penny to name a few. The Marlins have shown more financial commitment since 2003 with contract extensions to Hanley Ramirez in 2008 and Josh Johnson before the start of last season. It’s been now eight years since their last Championship, so the young talent they’ve acquired over the years are ready to blossom. After years of mediocrity Buck broke out last season in Toronto hitting a career-high 20 home runs. More impressive than his home run total was his average. His previous career-high was just .245 in 2006. Was last season a one-hit wonder? At 26, Sanchez had a solid rookie year. He’s not the prototypical power hitting first baseman, but he has solid patience at the plate. He’s also an underrated defender. If you want to talk about a guy who’s earned his stripes, Infante is it. In 2008, the Braves acquired Infante for Jacque Jones from the Tigers. Infante struggled at the dish in Detroit. He’s come a long way since his.222 batting average in 2005. In Atlanta, the coaching staff shortened Infante’s swing and he’s reaped in the benefits; he was selected to his first All-Star Game last season. He was seventh in the NL in batting average. Uggla’s a big loss, but Infante is a very solid replacement. Oh, and he’s got a great glove. Ramirez has said during Spring Training that he’d like to steal more bases this season. I guess he’d like to equal his 51 stolen base totals in 2006 and 2007. Ultimately if the Marlins want to be successful, Hanley needs to mature and be the leader of this young team. He was benched for several games in May due to his inadequate effort and hustle in the field. Everyone in Florida is making comparisons to Mike Lowell. The 2007 First Round pick has a stellar glove. I’ve yet to see Morrison swing at a bad pitch; his plate discipline is remarkable. He’s not going to hit a bunch of home runs, but he makes solid contact and does possess gap power (20 doubles and seven triples). The 2009 Rookie of the Year is coming off a pie mishap, which caused season-ending knee surgery. We’ll see how the knee holds up this season because he’s a main cog at the top of the lineup. Entering year three, Coghlan suffered a sophomore slump after a stellar rookie year where he hit .321 and scored 84 runs in 128 games. Stanton’s a big boy! Only four players have hit more home runs at 20 or younger than Stanton; Mickey Mantle, Ken Griffey Jr., Frank Robinson and Vada Pinson. This is a future home run leader here. Last season’s ERA winner is the most underrated pitcher in baseball. The key to Johnson is his health as he missed several starts last year due to numerous nagging injuries. He led baseball in quality start percentage; 23-of-28 starts (82 percent). I’ve said it before; he could turn in a 2003 Postseason version of Josh Beckett if he gets the chance to pitch in October. This may wind up to be a key offseason signing if Vazquez can forget about last season. After a phenomenal 2009 season with Atlanta where Vazquez was 15-10 with a 2.83 ERA, he blew up with the Yankees. He had a 5.32 ERA last year. How can we possibly explain this? Well, some guys just don’t have what it takes to pitch mentally in the Big Apple. Now, Vazquez gets to pitch in front of 549 people each night in Florida. I think Vazquez bounces back. After a great 2008 season where Nolasco went 15-8 with a 3.52 ERA, he was anointed as the next big thing. He’s shown the potential to become an “elite” pitcher with some dominant outings, but at 28, Nolasco has yet to fulfill the elite designation. He hasn’t shown enough consistency, but when he has that curveball going, he’s tough to hit. Sanchez is fully back from a torn labrum he suffered in 2007; he struggled mightily in 2008 with a 5.57 ERA. His 91.3 MPH fastball average was the highest of his career. Volstad showed promise as a rookie in 2008, but it seems like he has regressed each season since. He does eat up quite a few innings for a fifth starter. Mujica and Webb come over from San Diego in the Cameron Maybin trade. They were solid pieces in the Padres bullpen. The 35-year old Choate is a solid lefty. Hensley is another former Padre. He found his way in Florida, but let’s see if he can duplicate last season’s success. Nunez throws hard, but his changeup is his best pitch. This team has talent, but it’s up to the Marlins to translate that talent on to the field. The loss of Uggla in the middle of the lineup hurts, but I think the acquisition of Vazquez will ultimately be a positive one. This is a potential wild card team this year. Dan Uggla and Freddy Gonzalez have reunited. Atlanta acquired the power hitting second baseman via trade during the offseason. At 38, Wagner walked away from the game despite a dominant 2010 campaign. He saved 38 games to go along with a minuscule 1.43 ERA. We’ll see if Craig Kimbrel is ready to fill in and close games. McCann is one of the most consistent hitting catchers in baseball. Coming off his fourth Silver Slugger Award in his last five years McCann has hit 20-plus home runs, and driven in 80-plus RBI’s in four of his last five seasons. I’m curious to see if he can get his batting average back over .300 again after a two-year dip. He’s had two Lasik surgeries done because of ongoing eye problems. Freeman is a NL Rookie of the Year candidate at first base. He doesn’t have the pop that you would expect out of a first baseman, but he’ll hit for average; reminds me a lot of James Loney. He also has a solid glove. Has anyone declined quicker over recent years than Chipper Jones? After making a run at .400 for much of the 2008 season, Jones hasn’t eclipsed the .270 mark in each of his last two seasons. At 39, Jones is on his last legs. I’d rather have Prado’s glove at second over Uggla but that’s just me. Another option is to move him to third if Chipper can’t recover from his ACL injury. 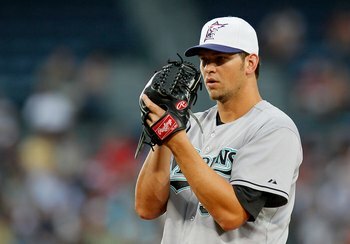 In his first year as a full-time starter Prado made the All-Star team. He’s hit over .300 over the last two years. McLouth has yet to regain his all-star form since his trade from Pittsburgh. Last season was a nightmare. After a dreadful start, Bobby Cox sent McLouth to Triple-A three months into the season. To his credit, McLouth bounced back and had a solid September. In 2008, he hit .276 with 26 home runs and 94 RBI’s. You can see what McLouth did last year above. (Three of those HR’s came in September) He’s still just 29 so I wouldn’t count him out just yet, although Jordan Schafer is lurking in the shadows. Heyward finished second in NL Rookie of the Year voting to San Francisco’s Buster Posey. He has all the tools at the plate; he’s disciplined who hits the ball hard. His .393 OBP was fourth in the NL, not bad for 21-year old. Following major elbow reconstruction Hudson won the NL Comeback Player of the Year Award. The biggest question now is at 35, can he possibly duplicate his 2010 campaign, especially after logging 229 innings. An excellent first full season in the Big Leagues for Mr. Hanson. He got no run support, which explains why he had just 10 wins last season. His slider rate, at 28-percent, is double the league average. For such a young starter, I’d like to see him cut that down; we don’t want his elbow turning into spaghetti now do we. Lowe was simply phenomenal at the end of the season; 5-0 with a 1.17 ERA in his final five starts. The sinker-baller gets the job done. A situational lefty is imperative in the NL East with Philadelphia’s stacked left-handed lineup. We saw what Javier Lopez did last year in the NLCS. George Sherrill needs to regain his 2009 form. Due to Billy Wagner’s retirement, Kimbrel is now the favorite to close. He needs to cut out his walks though, 16 in 20 innings is not good for a closer. But his strikeout rate makes up for some of that. To me it seemed like everything came together last season in Bobby Cox’s final run as manager. The Braves have a young, solid nucleus, but to expect some of the same results as last year is a bit unrealistic. I like Tim Hudson a lot, but is he going to repeat last year’s campaign; highly doubtful.